So Thanksgiving is in ONE WEEK. Just wanted to throw that out there. In case, you know, it slipped your mind or something. Also, cranberry pecan upside down cake. I mean, wowzers. Upside down cakes are pretty amazing in general, but this one is perfection. 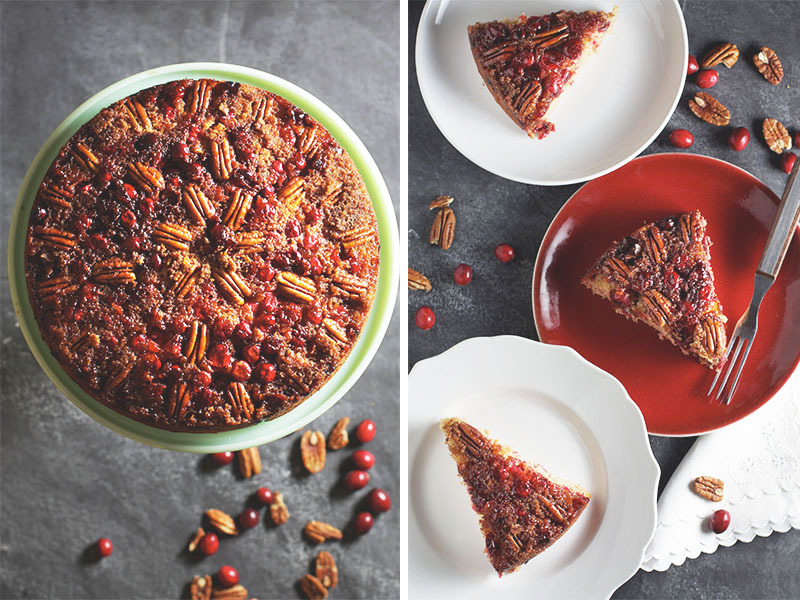 Tart cranberries, toasty brown sugar, and crunchy, buttery pecans make the perfect topping to a white cake batter that's been spiced up with a little cinnamon and nutmeg. I don't mind telling you that I'm eating a slice of this awesomeness as I type and I don't feel bad about it. I'll feel bad about it at 3am when I've eaten my 5th Tums. Because pregnancy heartburn. I've never been one of those people to proclaim what I'm thankful for each and every day during the month of November. I think it's a wonderful thing when people do, I just have never been one of those people. This year, I'm trying to be different. I'm trying to spend more time every day looking for reasons to be thankful and happy. Lucky for me, I don't have to look too far for those little things that make life sweeter. While I baked this cake, Riley ran around the kitchen singing Frosty the Snowman. That was a good moment. It was a great one, in fact. There is nothing like the smell of something delicious baking in the oven and the sweet sound of an almost-3-year-old voice sweetly singing. I hope that, if you make this any time during the holiday season, this cake brings with it plenty of moments to be thankful for. *Note: The batter for this cake is slightly adapted from David Lebovitz's recipe, which can be found here. Begin by making the topping. Melt the butter in a 9 inch cast iron skillet with 2 inch sides. Add the brown sugar and bring to a simmer, stirring constantly. Remove from the heat and let sit for 5 minutes before arranging the pecan halves and cranberries over the top of the brown sugar butter mixture. Cream the butter and sugar together in a medium bowl. Add the eggs, one at a time, and the vanilla, mixing fully into the butter and sugar. In a separate bowl, whisk together the flour, baking powder, spices and salt. Add half the flour to the butter mixture and stir with a spoon to combine. Pour the milk into the batter and stir. Add the remaining flour and mix until just incorporated. Pour the batter over the cranberries (directly in the cast iron skillet) and gently spread in an even layer. Bake 35-45 minutes or until the cake is golden on top and a toothpick inserted in the center comes out clean.